The NOISE1 is a simple noise-maker based around a Schmitt Trigger chip. This solder free, breadboard synthesizer kit was designed for The Contemporary Austin’s Tech Sounds family workshop. 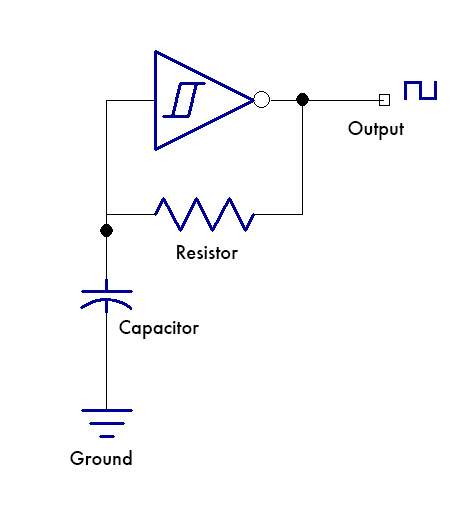 As shown where, a Schmitt trigger can be made into a square wave oscillator with only two components, a resistor and a capacitor. If a variable resistor like a photocell or potentiometer is used, the pitch can be easily changed. 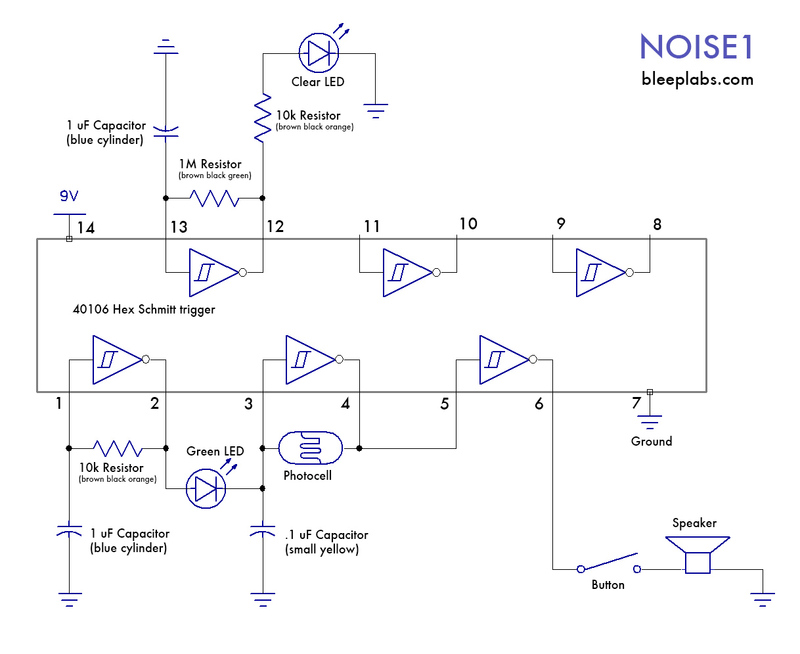 The NOISE 1 uses 3 oscillators to produce an audible square wave (from Schmitt trigger at 3 & 4), a modulator (1 & 2), and a blinking light (12 & 13). 5 & 6 are used as a buffer so the attached speaker can operate. You can try swapping out the resistors between 1&2 and 3&4 with potentiometers or photocells to change the rate of those oscillators. The 10k resistor attached to the LED controls its brightness and should not be bellow 120 ohms. Capacitors also adjust the pitch of the oscillators. The large 1uF cap makes the light blink slowly while the .1uF produces audible sounds. The green LED allows the pin 1 & 2 oscillator to effect 3 & 4. A standard diode works too. The speaker is a little quite due to it not having a real amplifier. You could try a single NPN amp like this one since really we’re just turning the speaker on and off (well have an exact schematic for this soon), or a more powerful LM386, or just replace the speaker with an output jack. Two Schmitt triggers are left open in the NOISE1 so you can add even more noise! And especially, any book by Forrest Mims.